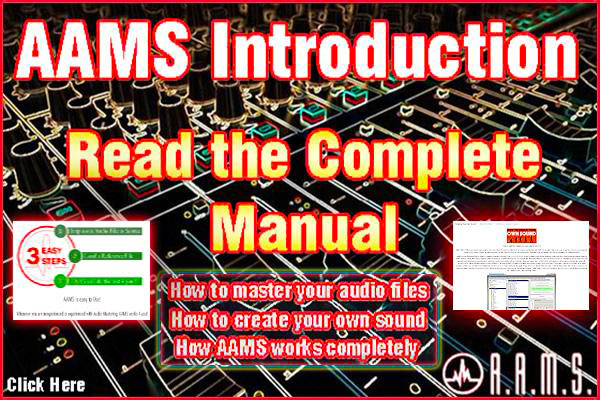 Welcome to AAMS, the introduction towards Automatic Audio Mastering! As a musician or engineer working on music, you need the best sound possible when releasing material to the public. To audio master a mix towards a professional commercial quality recording and to create a sound for all audio speaker systems is a difficult and time consuming task. AAMS is windows freeware for Audio Mastering. Featuring 100 Band Equalizer, 8 Multiband Compression, Balancing and Loudness settings for internal DSP Processing with all audio corrections automaticly done purely inside the AAMS Program. Also AAMS installs a Reference Database of 200+ Musical styles. Creating your own personal sound! Making the mastering process easy and less time consuming, having a good overall commercial sound quality, to process your Mix to a commercial great sounding Master. Mastering audio can be an extremely sensitive process, even the slightest miscue can lead to a disaster. AAMS Auto Audio Mastering System can help you prevent as well as improve the overall quality of any audio source. AAMS analyzes your original audio file, then compares the internal audio processing settings to over 200+ different styles within its very own database. AAMS will generate a mastering plan and setup the internal dsp-processors and processes all audio files in a single go! 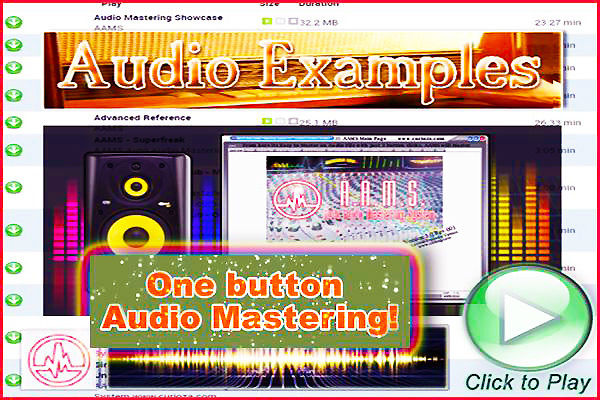 Audio Mastering with a few button clicks, batch mastering for multiple files at once. Allows individual tracks to be compared, analyzed and mastered in a single go. All audio mastered files are written on your harddrive as wav or mp3. Results show in Full Spectrum Display, Equalization Suggestion, Multiband Compression, Balance and Loudness Volume. Even printing charts and mastering documents. Works on both raw tracks and tracks that have already been mastered, completely free to use! Bring your music to the next level, full automatic mastering, semi-automatic mastering, manual mastering setups for different kind of users (pro). This program is definitely worth a try for anyone who works with music, regardless if you're the creator or the technician. Take your audio to the next level with this completely excellent to use audio mastering software program. Over 200+ different styles to compare your track to. Requires very little user input. Reference Database File, out of the Reference Database of +200 Styles. The AAMS V3 Professional Version has got no limitations! Use AAMS database of 200+ database of references or input other artists commercial music, combining them to one reference, a new style. Let AAMS help you find your own sound, you can create your own sound with building a user made reference or change a reference by adjusting the frequency spectrum for centrle, left and right channels. And master your music tracks on the fly, over and over, again and again. AAMS V3 professional version is tested to do masterings over > 1 hour of playtime! 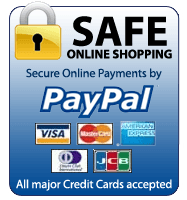 For DJ mixtapes and DJ sets, live concerts or any other recording or mix. The professional options of AAMS audio mastering software will make every kind of user happy, like batch audio mastering multiple audio files and the writing of between files of DSP processing. The user can tweak and manipulate the outcome of all AAMS audio masterings. Because once you find your sound, you can copy that sound to another track and so on. Therefore have complete control by using your own references, adding, combining, adjusting and saving all for later repeated use! The basic idea of AAMS Suggestions by the AAMS Analyzer is, to copy the sound but not harm the original recording. AAMS is written to understand differences between what the original recording sounds alike and looking for a way to get to what the reference sounds like. And what an engineer would do in case of manual mastering, aams will do the same, but then always based on the same calculations from AAMS Analyzer, this will give the user a steady base. AAMS suggestions and control settings are passed to the DSP controls. Processing of EQ, Compression, Balancing and Loudness are done by AAMS. Alike hardware equipment mixing controls, pan and volume, eq, compressors and loudness balancing. The mastered result is what counts basically. 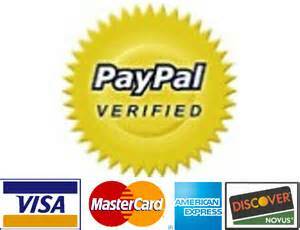 AAMS main feature is automatic mastering, but semi-automatic mastering or even manual mastering is provided. 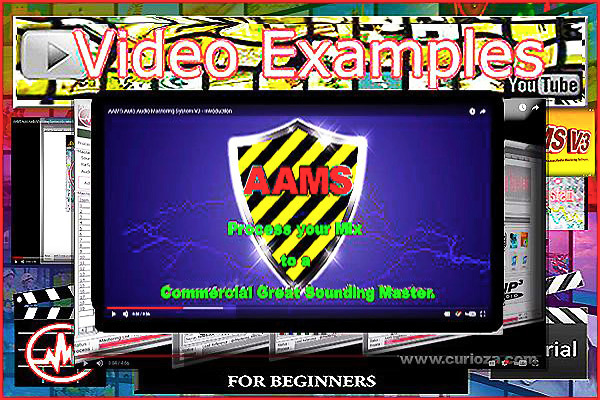 AAMS will do all processing for you, with the AAMS Professional Registered Lisenced version, you are in complete control. Another factor is, AAMS repeats the quality. You can expect the same thing happening on other sources and audio quality wise AAMS gives steady results over and over. Create your own sound and be in full control with AAMS V3 Professional Version! Actually think it`s does a fairly decent job . The only problem with it is finding the right reference track. We use it in our studio for our "budget" low cost recording to keep the cost down for our customers and so far people have been very happy with the results . Engineers are going to hate it that’s for sure, well most will . 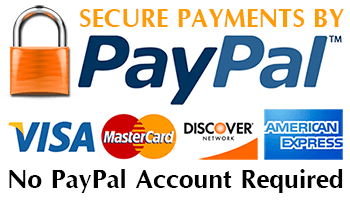 Personally it save a lot of time in our studio as we have a lot of clients that come in record a few songs to backing tracks and don`t have a lot of money to pay me by the hour to master them properly, so this is a great alternative option to a) save our clients’ money b) allows us to take on clients on a tight budget and c)doesn`t cost a huge amount of money to buy. Finally , as you can load it up with wavs and let it get on with it you can get on and do other things making it a very useful tool in our busy environment. P.s. One more thing to mention. If you master a track yourself ,using Wavelab or whatever you use ,that’s going on a certain album you can create a reference track from that and then use AAMS to master the rest of the album using that reference track and for that is works very well.